Here is a lovely Carob Fruit Candy recipe that is full of goodness and very, very tasty. This candy makes a refreshing afternoon snack. Serve it with a nice cup of tea or coffee for guests, or wrap them up in waxed paper and pop them in your kids' lunch box. It is a treat they will love. Combine powdered milk and carob powder in a bowl. Add remaining ingredients, except coconut, mixing well. 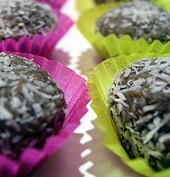 Mold mixture into balls and roll in the coconut. As an alternative, the coconut can be mixed in and the mixture rolled into a long rope, then cut in slices. This "chocolate carob" recipe is such a nice change from regular chocolate candy. It is especially good when you are expecting or nursing a baby and need to cut out the caffeine. You can still treat yourself to something decadent, but full of goodness too. If you are looking for carob and other candy making ingredients, you may want to check out the selection at Candyland Crafts. I hope this carob candy recipe puts a smile on your face as you sink your teeth into the finished product. If you need an idea of where to pick up some good carob powder for candy making, or if you'd like to order some ready made carob candy, here's a little selection for you to consider.